In HFM, there can be the complete absence or underdevelopment of external and middle ear structures; however, inner ear anomalies are rare. 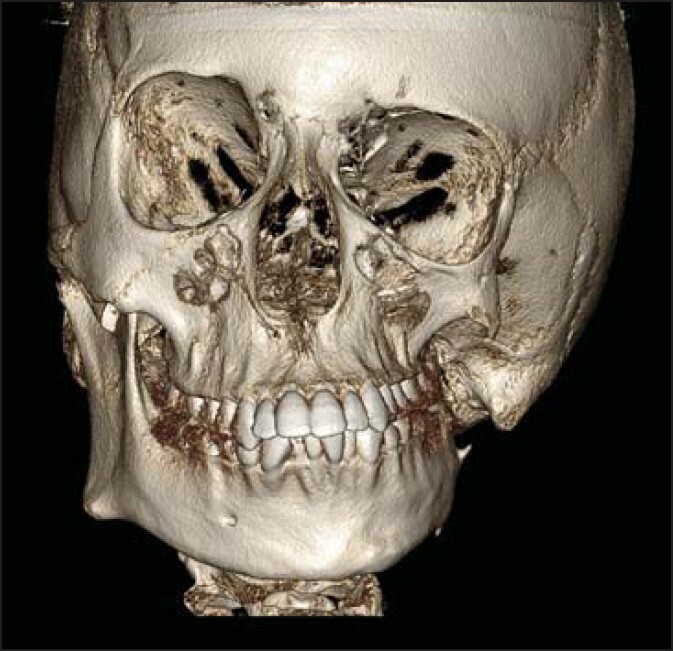 In this article, a case of craniofacial microsomia is presented with its characteristic radiological features that will help us understand and diagnose this rare entity. Hypoplasia of the left side of face [Figure 3]. Absence of left condyle and coronoid process [Figure 4]. Absence of left glenoid fossa. Hypoplastic left ramus of mandible. Hypoplastic left zygomatic arch [Figure 5]. Absence of external auditory canal and middle ear structures on the left side [Figure 6]. 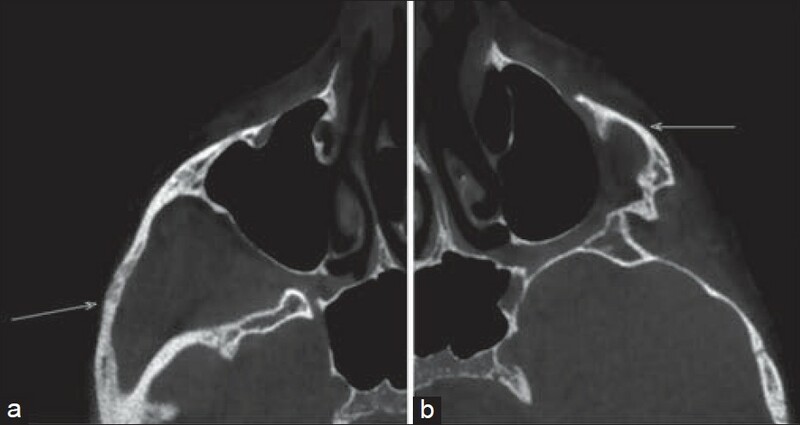 Absence of the mastoid air cells on the left side [Figure 7]. Underdeveloped inner ear structures on the left side [Figure 8]. 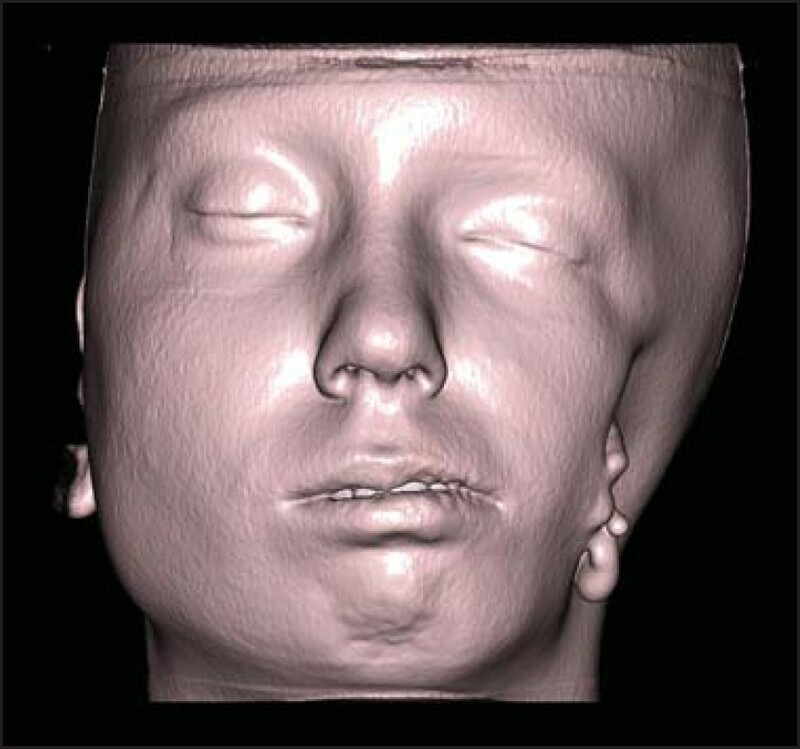 On the basis of clinical and CBCT scan findings, the diagnosis of cranio facial microsomia was made. The clinical features of HFM include flattening of the face on the affected side due to hypoplastic maxillary and malar bones and aplasia of the mandibular ramus and condyle. The eye may thus appear to be on the lower level than that of the affected side. Malformation of the external ear may vary from complete aplasia to a crumpled, distorted pinna. The chin and the facial midline are off-centered and deviated to the affected side. Often, one corner of the mouth is situated higher than the other, giving rise to an oblique lip line. There can be hypoplasia of muscles such as the masseter, temporalis, pterygoids and muscles of facial expression on the involved side. Radiographically, extraoral radiographs and orthopantomograph reveal aplasia of the mandibular ramus and condyle, hypoplastic maxillary and zygomatic bone. On the basis of clinical and radiographic findings, final diagnosis of HFM can be made. 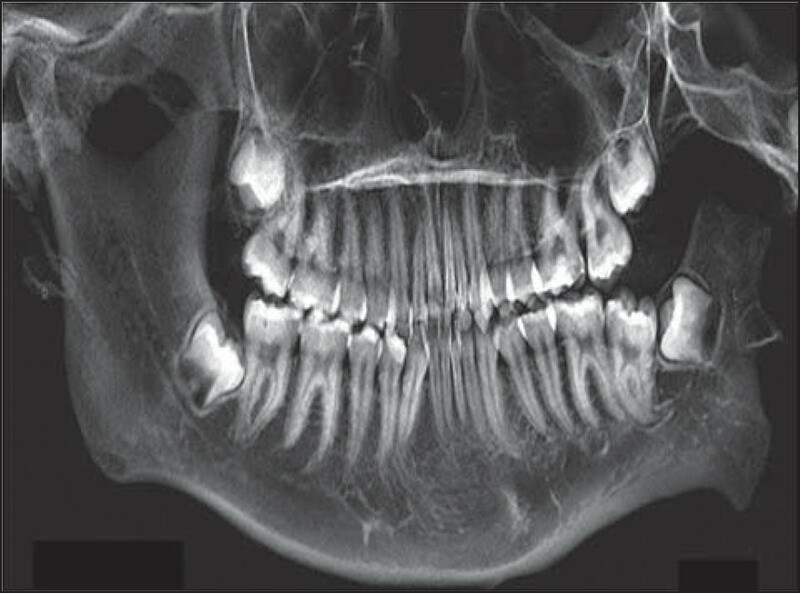 Advanced imaging such as computed tomography (CT) and CBCT is required when correction of the facial asymmetry is planned with orthodontic treatment and orthognathic surgery. Also, when sensorineural hearing loss or facial nerve dysfunction is present, CT or magnetic resonance imaging (MRI) may be advised. MRI is helpful to study the hypoplasia of facial muscles and to study the facial nerve in patients with HFM. MRI can also be used to study the temporomandibular joint mainly the articular disc and condyle relationship, when surgical procedures like mandibular distraction osteogenesis are planned. CBCT with its dual advantage of low radiation dose and high image resolution is becoming an integral part of dentistry. CBCT has various dental applications such as implant planning, precise localization of impacted teeth, to study various pathologies such as odontogenic cysts and tumors, temporomandibular joint disorders. CBCT is also helpful for paranasal sinus and temporal bone evaluation and airway analysis in sleep apnea cases. Direct volume rendering with CBCT generates excellent 3D images which are very helpful for orthognathic surgeries. In advanced CBCT software, there is an option of superimposition, in which the follow-up scan can be superimposed on the old scan to study the treatment outcome. In the present case, the 3D images were generated with CBCT as per the requirements of referring oral surgeon. CBCT scan revealed aplasia of left mandibular condyle and coronoid process, absence of left glenoid fossa, hypoplasia of left mandibular ramus, hypoplastic left zygoma and zygomatic arch. When temporal bone was studied carefully, there was a complete absence of external and middle ear structures on the left side. Furthermore, there was the absence of the mastoid air cells and inner ear structures were underdeveloped. A craniofacial team, which includes plastic Surgeons, Otolaryngologists, Orthodontists and Prosthodontists is involved in the treatment of HFM. The objective of this treatment is to restore the facial symmetry and proper functioning. 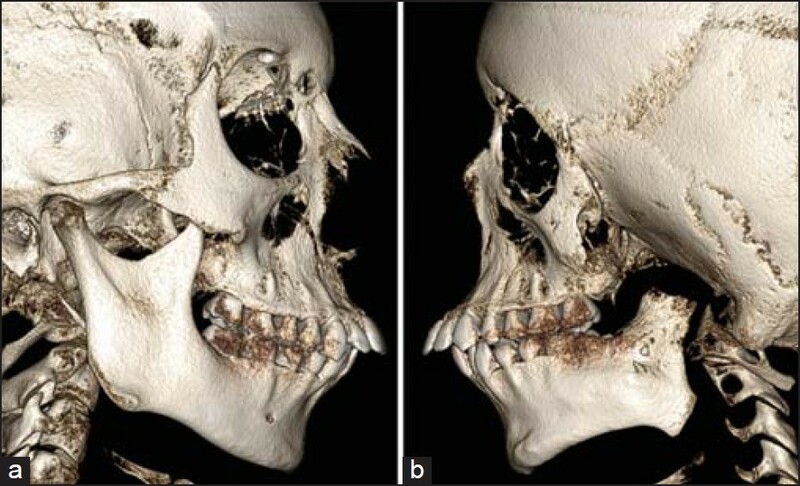 The purpose of this article is to add one new interesting case with typical clinical and radiological features of craniofacial microsomia and to point out that whenever such case is encountered, the dental radiologist should critically evaluate the temporal bone as inner ear anomalies though rare, can occur in association with craniofacial microsomia. 1. Gorlin RJ, Pindborg JJ. Syndromes of the Head and Neck. New York: McGraw-Hill; 1976. p. 261-5. 2. James DR, Baggs PR. Craniofacial anomalies. In: Adams DA, Chinnamond MJ, editors. Scott-Brown's Pediatric Otolaryngology. 6 th ed. Oxford: Butterworth-Heinemann; 1997. p. 1-53. 3. Converse JM, McCarthy JG, Woodsmith D, Coccaro PJ. Craniofacial microsomia. In: Converse JM, editor. Reconstructive Plastic Surgery. 2 nd ed. Philadelphia: W.B. Saunders; 1977. p. 2359-400. 4. Sze RW, Paladin AM, Lee S, Cunningham ML. Hemifacial microsomia in pediatric patients: Asymmetric abnormal development of the first and second branchial arches. AJR Am J Roentgenol 2002;178:1523-30. 5. Gorlin RJ, Jue KL, Jacobsen U, Goldschmidt E. Oculoauriculovertebral dysplasia. J Pediatr 1963;63:991-9. 6. Monahan R, Seder K, Patel P, Alder M, Grud S, O'Gara M. Hemifacial microsomia. Etiology, diagnosis and treatment. J Am Dent Assoc 2001;132:1402-8. 7. Kapur R, Kapur R, Sheikh S, Jindal S, Kulkarni S. Hemifacial microsomia: A case report. J Indian Soc Pedod Prev Dent 2008;26 (Suppl 1):S34-40. 8. Moulin-Romsée C, Verdonck A, Schoenaers J, Carels C. Treatment of hemifacial microsomia in a growing child: The importance of co-operation between the orthodontist and the maxillofacial surgeon. J Orthod 2004;31:190-20. 9. Carvalho GJ, Song CS, Vargervik K, Lalwani AK. Auditory and facial nerve dysfunction in patients with hemifacial microsomia. Arch Otolaryngol Head Neck Surg 1999;125:209-12. 10. David DJ, Mahatumarat C, Cooter RD. Hemifacial microsomia: A multisystem classification. Plast Reconstr Surg 1987;80:525-35. 11. Vento AR, LaBrie RA, Mulliken JB. The O.M.E.N.S. classification of hemifacial microsomia. Cleft Palate Craniofac J 1991;28:68-76.